It’s difficult to sell to people who don’t know your business. But with email marketing, you can build strong relationships with prospects and promote your products to them any time. In this article, you’ll learn the only ecommerce email marketing tips you need to know to sell more products or services on the web. According to a study by the Baymard Institute, 70% of shoppers abandon their carts. Abandoned carts cost online retailers about $260 billion in revenue each year. You lose money when you don’t send abandoned cart emails. When you do, you’ll get some customers to complete their purchases. Some ecommerce stores revealed that their revenue increased when they send abandoned cart emails. Shoppers abandon their carts for various reasons. 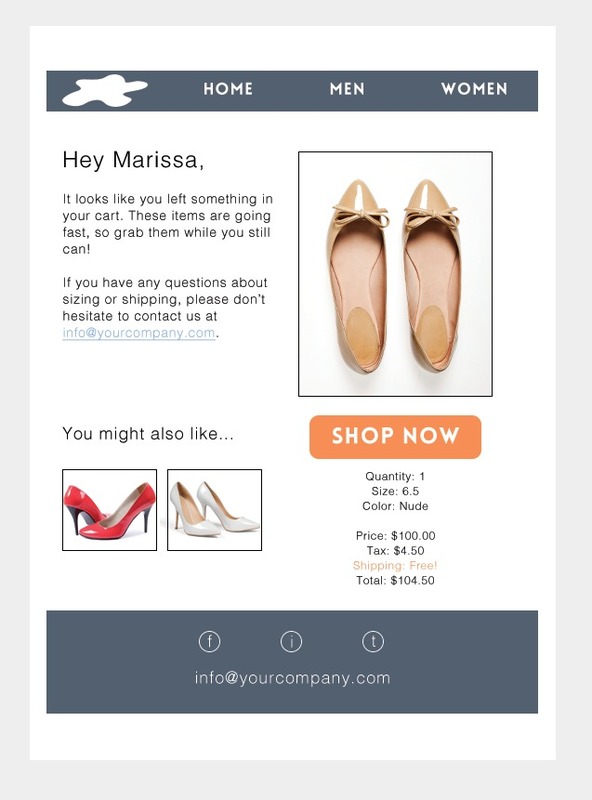 Sending an abandoned cart email gives you a second chance at gaining some new sales. 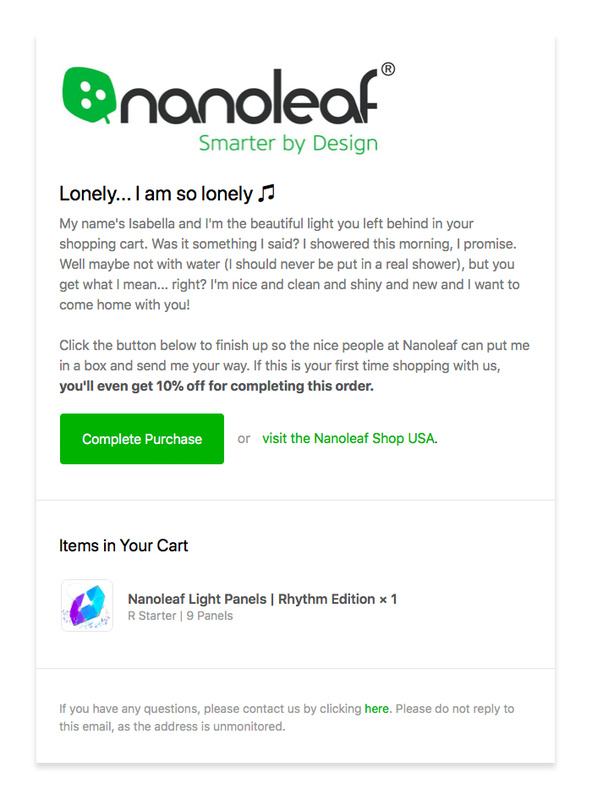 Nanoleaf, a company that sells personalized lighting sent emails that helped 30% of its abandoned carts convert into product sales. 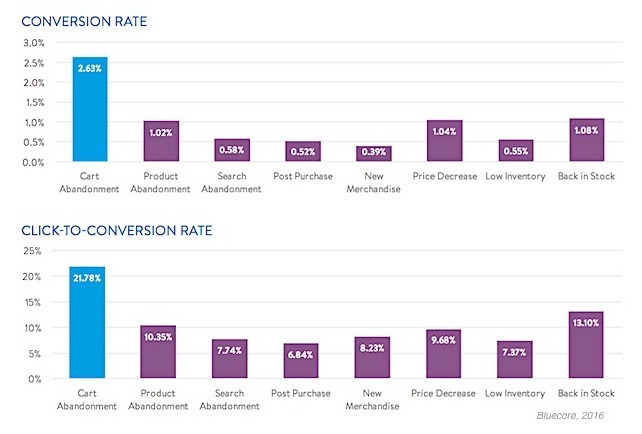 Research by Bluecore shows that cart abandonment emails have the highest average conversion rate (2.63%) and click-to-conversion rate (21.78%) of any triggered ecommerce email. These emails are reminders that span across a few days after a customer abandoned their cart. Some retailers send reminders over 2 – 5 days. Don’t make your series last more than a week. A customer who abandoned their cart 7 days ago has probably moved on. Maybe the customer had bought from a competitor. Or, the customer isn’t interested in buying again. Each email in the series should be interesting. Each email should offer the customer something special. This is a single email that encourages the customer to complete their purchase. Some ecommerce businesses usually send this email after a day. Should you send a single abandoned cart email? It depends on the complexity and price of your product or service. 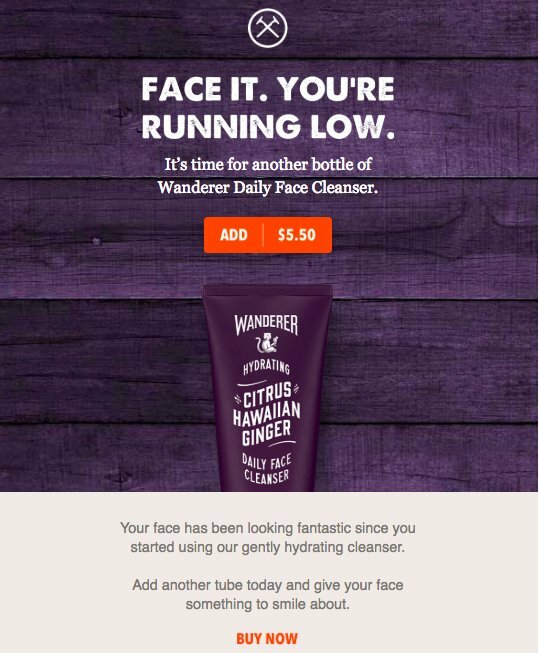 If the price of your product is between $50 – $50, sending a single abandoned cart email might make sense. But if you’re selling a product that’s worth $100 – $500, shoppers might hesitate a bit more. Therefore, it makes much sense to send an email series in this case. Great promotional emails convert customers right away. Their job is to sell to the customer. You should see some sales after minutes and hours of sending a promotional email. Below is a promotional email from Teavana, a tea company based in Seattle, Washington. 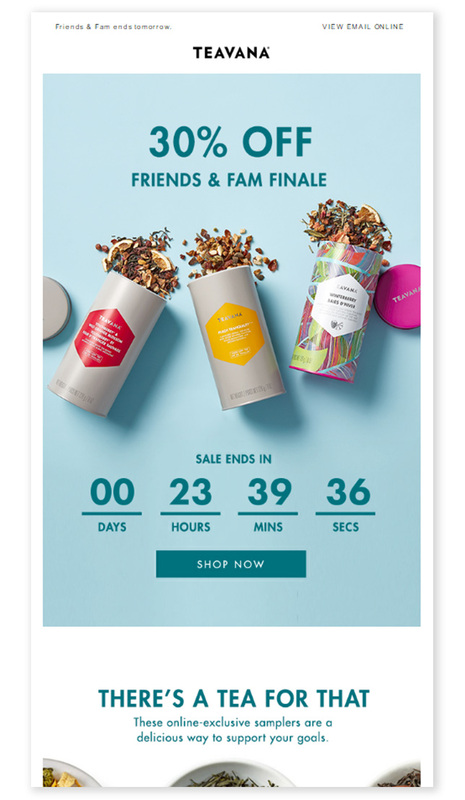 Teavana offers their customers 30% discount if they buy in less than 24 hours. This type of promotional email work. Customers know that they must buy within a specific period to qualify for the discount. Got a new product your customers will love to have? Send a promotional email announcing the product. Make it easy for customers to buy by offering them discounts, free trial or money-back guarantee. 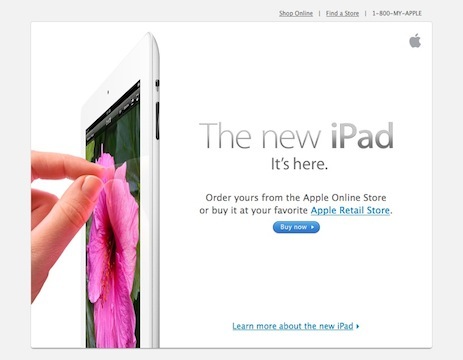 Use the announcement email to highlight what customers will get from the new product or service. Explain the problem it helps them solve. Get your customers thinking about the problem. Present the product as the solution. First access promo emails are another form of new product promo emails most software-as-a-service (SaaS) businesses use. Because you’re a subscriber, a company could grant you early access to their product or service for a fee. Even a store like Nordstrom is sending early access promotional emails to its customers. Holiday emails are also another form of promotional emails that work. Ecommerce email marketing is more effective during holidays. It’s a period when many shoppers expect to receive some special offers in their emails. According to research by Yesmail, most consumers open emails from businesses during the holiday season. You need to appeal to each subscriber. You can’t do that without email segmentation. You need to segment subscribers based on their interests, needs, previous purchases, actions, and more. You can segment subscribers into tens or hundreds of categories. 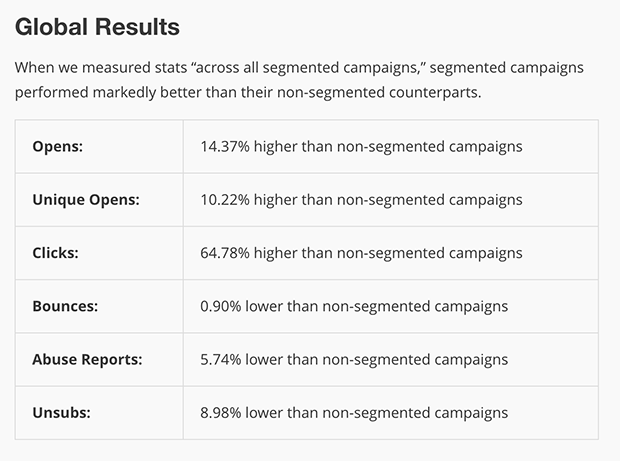 So how do you segment your email subscribers? High AOV customers are your most valuable customers. They spend more on average than every other group on your email list. Put them in a separate category. You can further segment them into sub-categories. For example, some high AOV customers buy monthly. You should ensure that you’re sending them valuable offers at the end of each month. If you sell different products on your ecommerce site, some of your high AOV customers buy a lot of products together. Recommend these products together when you send them marketing emails. Some of your high AOV customers buy all the products they need at once. They buy occasionally, and they buy BIG when they do. Offer them all the products they need and sweeten the deal with some additional offers they may not be expecting. Recognize the different buying behaviors of your high AOV customers and target them accordingly. This group of customers only buy when you offer discounts on items. I also call them discount shoppers. They rarely buy at the normal price. That’s because they always want to save money. Put this group of customers in one category. Discount shoppers are valuable customers to your business. They may tell their friends about your business. Start a refer-a-friend program that makes them qualify for discounts. They’ll be happy to send some friends to your business, mention your brand on social media if it means they will get 50% discounts. You can also start a loyalty program where you offer customers free products and discounts when they spend up to a certain amount on your products or services. Exclusivity buyers are different from High AOV customers. Exclusivity buyers are interested in new and exclusive products. They aren’t interested in discounts. Yes, discounts are everywhere online these days, and almost everyone likes them. But few people don’t. These people are exclusivity buyers. Every email list has a few exclusivity buyers. You can sell more to them too. To convert exclusivity buyers, you need to offer them exclusivity – something they treasure most. Give them early access to your products or services. Up-sell and cross-sell emails make customers buy more from you. Up-selling means selling more expensive products or services. It also means selling upgrades or add-ons. Cross-selling means selling different products or services to the same customer. The products could be unrelated to each other. Ecommerce businesses have been using up-selling and cross-selling to boost their sales for a long time. Up-selling and cross-selling are even more effective when combined with email marketing. Sending up-sell and cross-sell emails will increase your ecommerce store’s average order value. There are three types of up-sell and cross-sell emails you can send to your email subscribers. It’s highly recommended that you send your customers receipts after buying your products. A receipt let the customer knows that payment was received and processed. Consumers consider email receipts one of the most important messages in their emails. In most industries, the average open rate for emails is 17.19%. But email receipts have an average open rate of 70.90%. Email receipts also receive more engagements, 8.93% compared to 2.70%. You can use your receipts to up-sell and cross-sell. 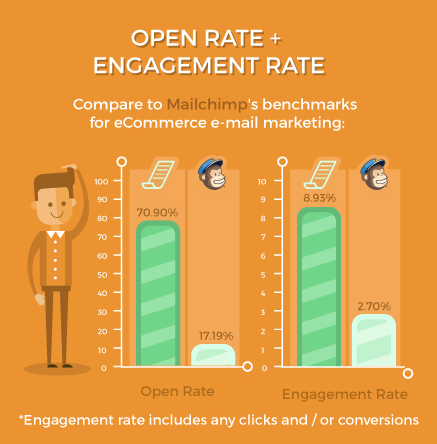 Customers open and engage with them more than regular emails. If someone has bought your product, they may be interested in buying similar or related products. Send them a follow-up email thanking them for purchasing. Ask for reviews and use the opportunity to promote your other products. You may include products people frequently buy together with the products they had bought. If you run a large ecommerce store where you sell hundreds of different products, it’s likely that products are grouped into categories. A customer who bought a product from a category may be interested in buying other products in the same category. You can send a follow-up email promoting products in the same categories to customers. Amazon uses this email marketing tactic. For example, if you buy a mattress on Amazon, they may send you emails promoting nightstands, dressers and bed frames because they are in the same category. Some customers have stopped buying from you. Maybe, the last time they bought was 2, 3, 4, 5, or 6 months ago. Don’t give up on those past customers. According to Harvard Business Review, it’s anywhere from five to twenty-five times more expensive to acquire a new customer than to retain an existing one. Customer acquisition has become harder and more expensive than years ago. It’s easier to win back previous customers than new customers who haven’t heard of your business before. You’ve already spent time and money on past customers. You’ve given them several promotions. You’ve made them feel special in the past. You can still win them back if you do the right things. You have their email addresses. Maybe their phone numbers too. Perhaps, you know their buying habits. You can customize your promotional offers based on information you have about them. 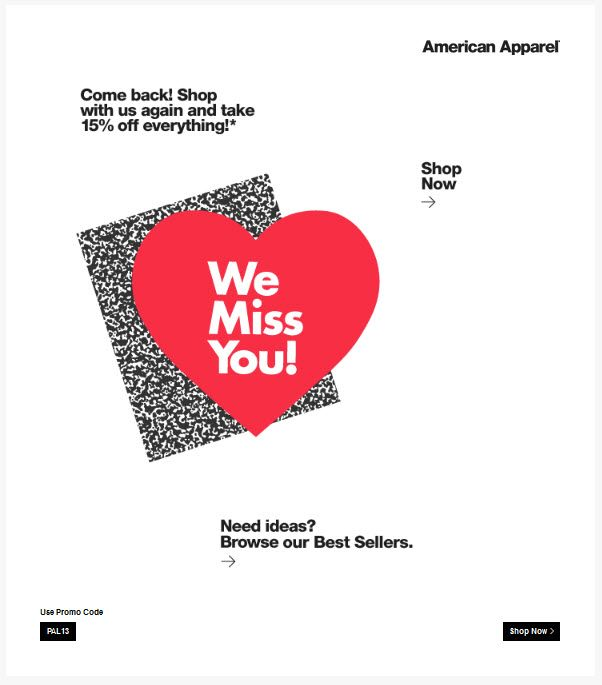 Send customers a friendly email telling them how much you’ve missed them. 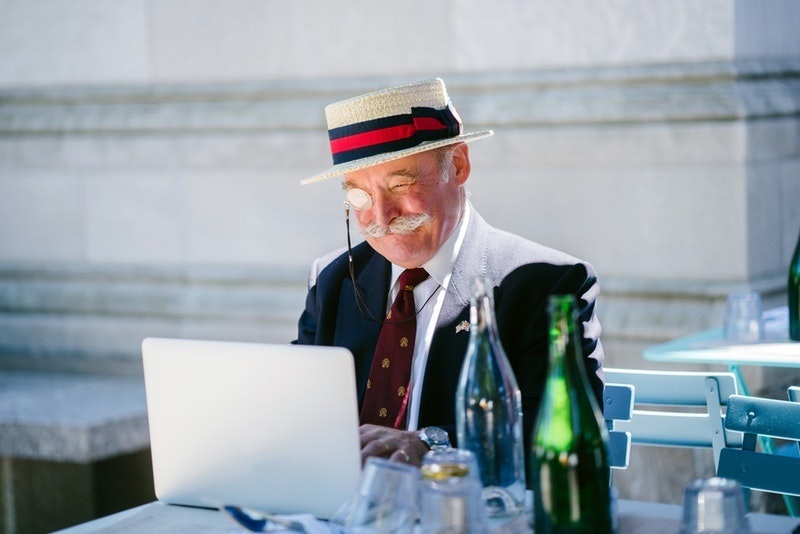 Email marketing is a great way to re-connect with customers. Make sure you include a discount as a bonus for buying from you again. Include a link to opt out in case previous customers don’t want to receive emails from you again. Some previous customers may not need your product or service anymore. If customers can only use your product for a specific period or number of times, there’s nothing wrong reminding them to buy again. You can’t use some products forever. For example, I buy body cream, shampoo, and toothpaste every thirty days. An email that reminds me to buy again at the end of each month will help me order faster. If you sell products or services where customers have disabled automatic renewal, you can send them emails asking them to renew. 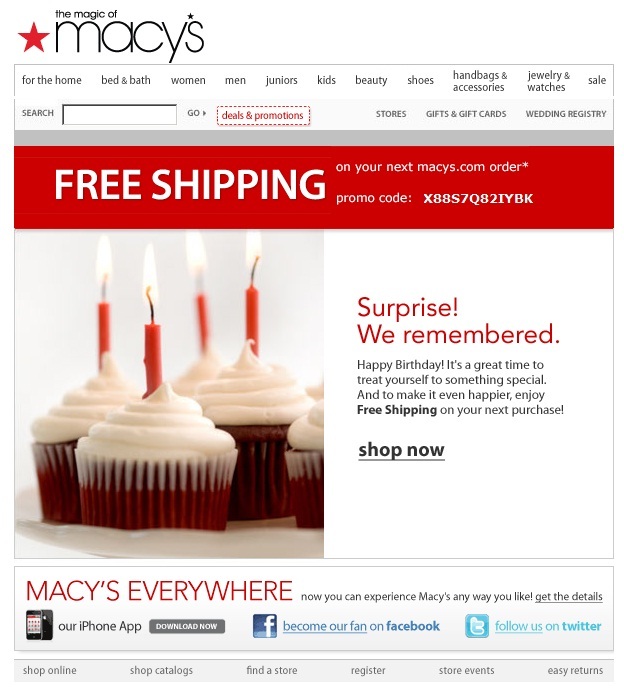 Some ecommerce stores collect the birthdays of their customers. They do this to offer customers some special deals on their birthdays. You should celebrate your customers’ birthdays with them. It could help you re-convert some customers who may have stopped buying from you. Their birthdays give you an opportunity to reach out to them again and put some smiles on their faces. Offer them unbelievable discounts, free shipping, free products, and maybe some handwritten notes. I love brands that contact me on my birthday. The first email message you send to your subscribers won’t be perfect. But you’ve got to start doing email marketing if you’re serious about increasing sales and retaining customers. While there’s nothing like a perfect email message, you need to continue to improve your messages to generate more sales. The answer is A/B testing. Learn from each a/b test you conduct. Many businesses wait too long to collect emails of shoppers on their sites. Don’t make that mistake. As you know, emails are the most important assets your ecommerce business can have. You can always reach potential customers and convert them when you have their email addresses. Collecting emails early during the checkout process will help increase the abandoned carts your business can recover from. I recommend you start collecting emails as items are being added to the carts. You can also ask for emails early while customers are reviewing their shopping carts. If a customer has given you their email before failing to complete the sale, it’s easy to bring them back to your site. After years of selling online, I’ve learned that email marketing is the most powerful medium for ecommerce businesses. Email has been around for decades and will continue to be. 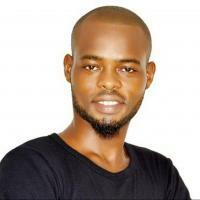 I advise that you invest more in email marketing than any other channel. 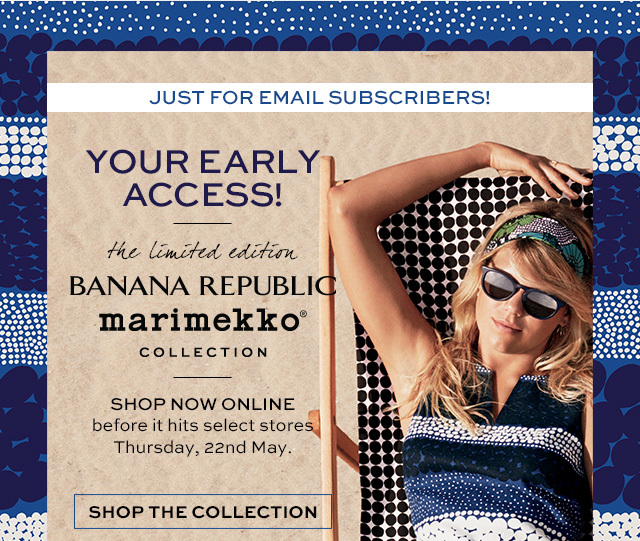 Do you want to start collecting emails on your ecommerce site starting today? Sign up for OmniKick. Our software will help you collect emails of visitors and customers on your site. Sign up for a free trial today.